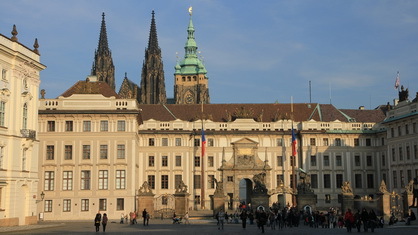 Located in the third courtyard of the Prague Castle. Created over the centuries, the cathedral is the dominant landmark of the castle. 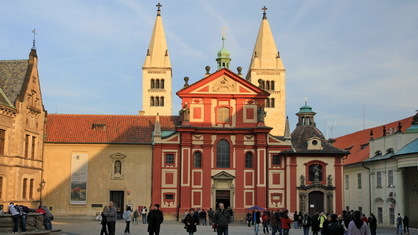 The Cathedral is situated on the third courtyard of the Prague Castle. 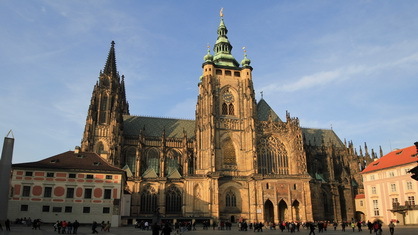 Official name is St. Vitus, St. Wenceslas and St. Adalbert Cathedral. 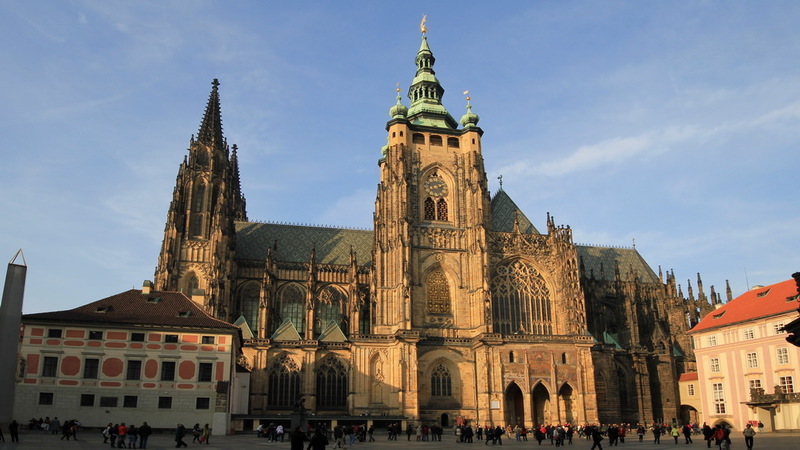 This Roman Catholic cathedral is the dominant building of the Prague castle. The first church on this site was Romanesque rotunda dedicated to St.Vitus, built around 930 by Duke Wenceslaus. In 1096 a bigger basilica was built on the same spot. In 1344 King Karel IV commissioned the construction of a new gothic cathedral in the current shape. Construction continued step by step for several centuries. The current shape was finished first in 1929. The church burned down several times in the course of it's history. There are four bells on the main tower: the biggest weighs 13500kg and originates from 1549. A lot of significant architects, sculptors, painters and other artists participated on the project. 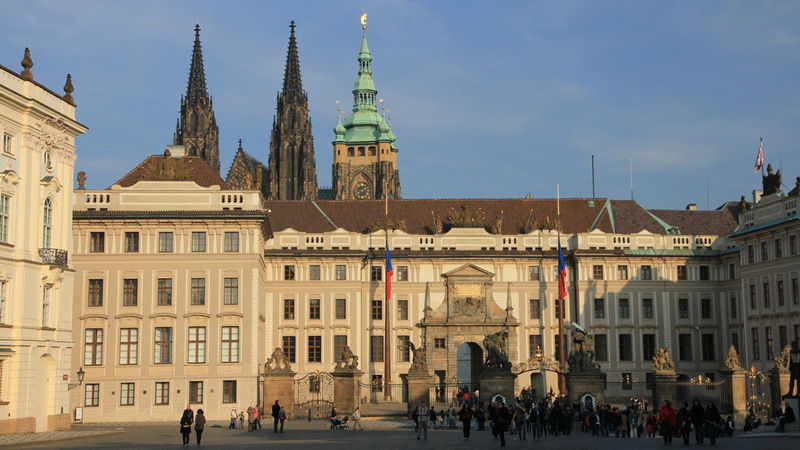 Prague Castle is an extensive cultural treasure. 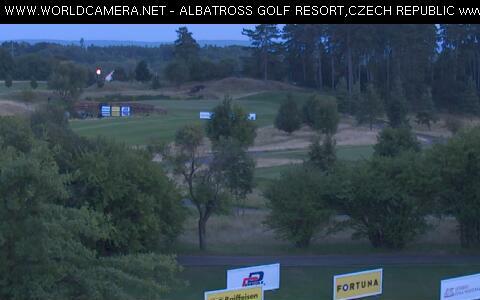 This well known Czech castle is located on a hill on the left bank of the Vltava river. First written records come from 885. Specificaly, the Royal palace, St.Vitus Dome, St.Jiri church and monastery, towers, fortifications, and gardens are parts of the castle. The castle has three courtyards. The buildings originate from different ages and all architectural styles from the past thousand years are present, starting with Romanesque style. The castle was besieged many times. In 1648 it was captured and ransacked by the Swedish army. 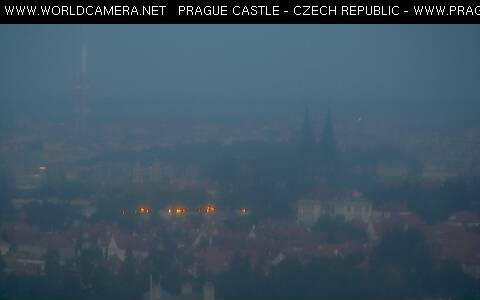 The castle was a seat of kings and after Czechoslovakia, and later the Czech Republic, was established, it became the seat of the president. The tower is a part of the northern castle's fortification. The Mihulka Tower was built in the second half of the 15th century. It is a part of the northern castle's fortification. Besides its defensive role, Mihulka tower was used for different purposes later. In the tower there was an alchemist's workshop and later gunpowder storage - this is where Mihulka tower got the name Gunpowder Tower. In 1967-1980 Mihulka tower was renovated and has been used as museum since 1982. 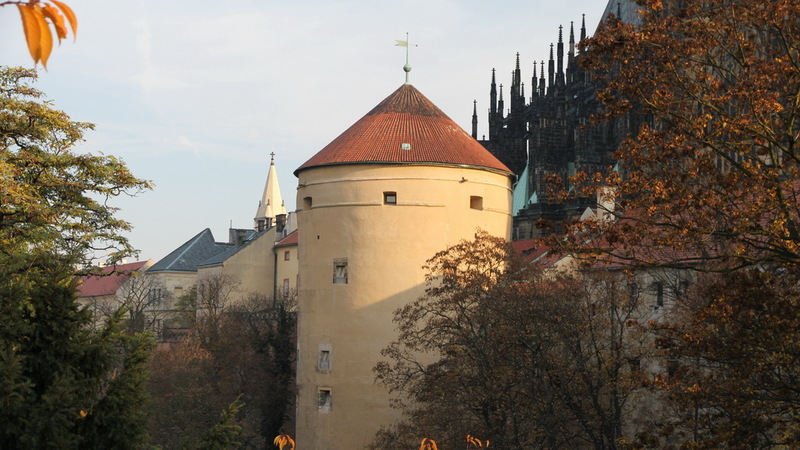 Currently there is the Military Historic Museum, with its exhibition of helmets, in the tower. Monastery and church. Currently there is an exhibition of National Gallery paintings inside. 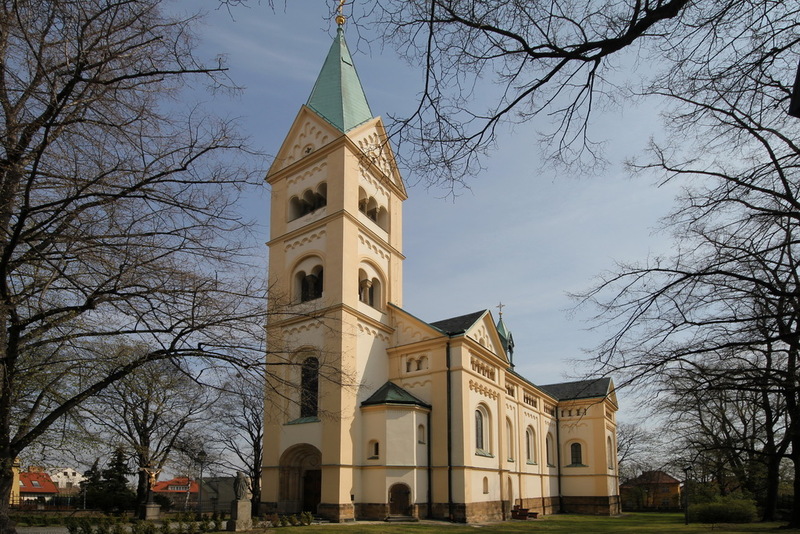 The church was founded in 921 by Duke Vratislav. Consecrated in 925. The Monastry was founded in 976. In 1142 the monastry burned down for the first time. 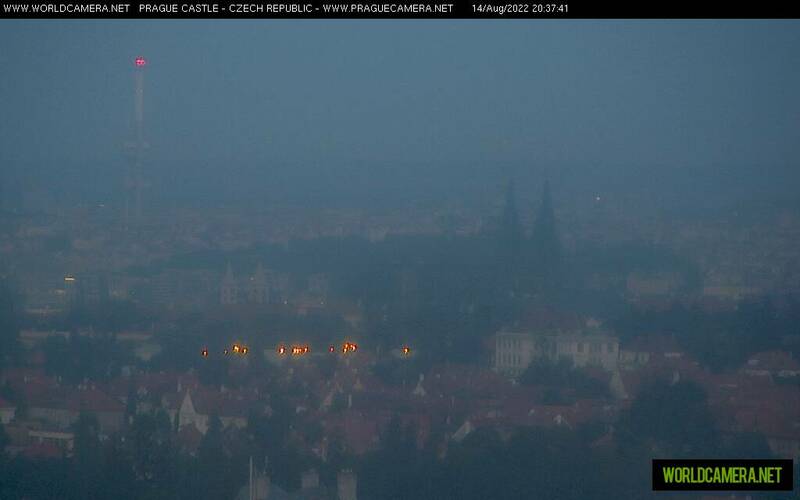 Then, was also damaged heavily in the big Prague Castle fire of 1541. In 1742 the monastry was closed and the building has since served several different functions. In 1963-1974 the building was renovated for National Gallery collections. An extensive 19th century Czech paintings exhibition was opened in the Spring of 1976 and this permanent exhibition remains to the present day. 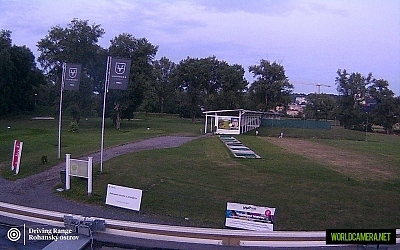 TV tower with panoramic restaurant. 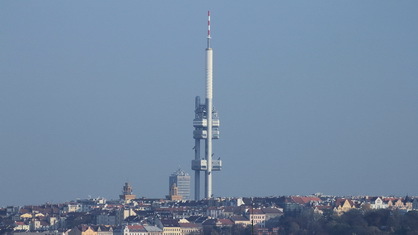 Prague Žižkov TV tower, standing at a height of 216m (720ft), is the tallest construction in Prague. The tower was built in 1985-1992 after long discussions and protests and remains a controversial construction today. 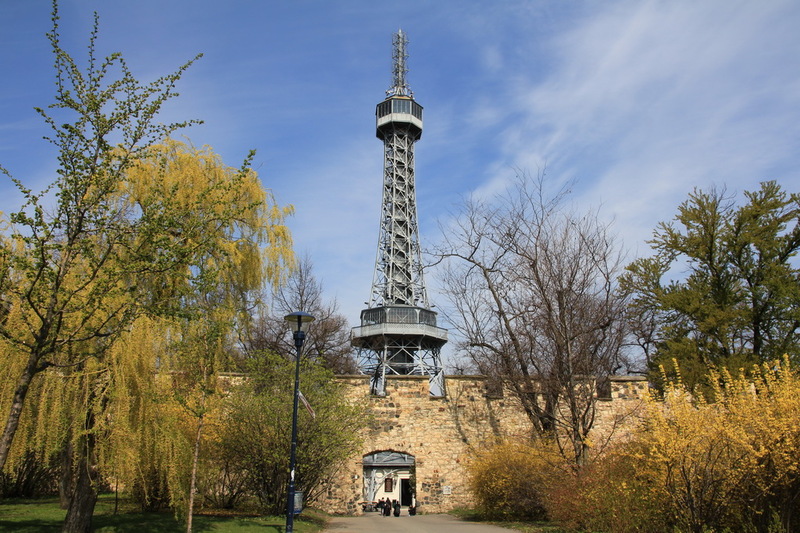 The tower is located in a park (Mahlerovy sady) at the edge of Prague Žižkov quarter, which gives it it's name. 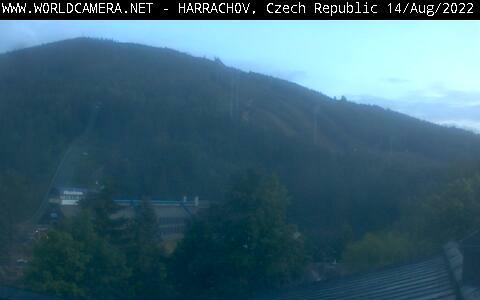 The different levels of the tower house an observation deck, a restaurant, TV transmitters and a meteostation. The small objects on the tubes are sculptures of climbing babies. The antenna tube is 216m tall, the smaller two tubes are just 134m tall. 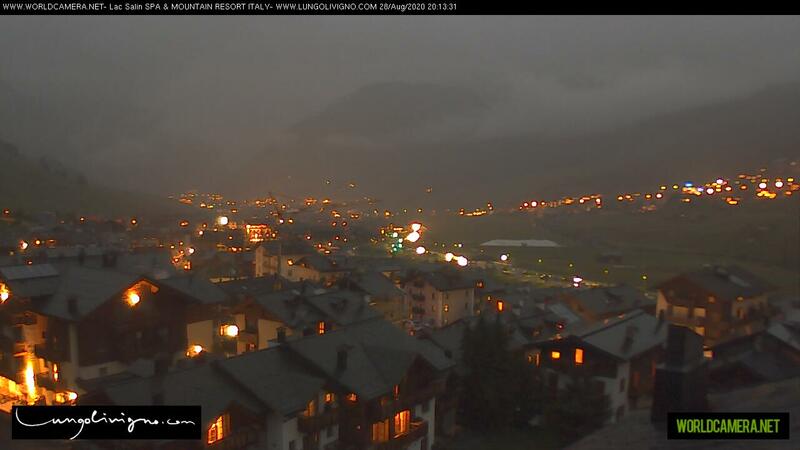 In good weather the visibility is up to 100km, from the observation deck. The tower was built in 1891 and the construction was finished in only four months. 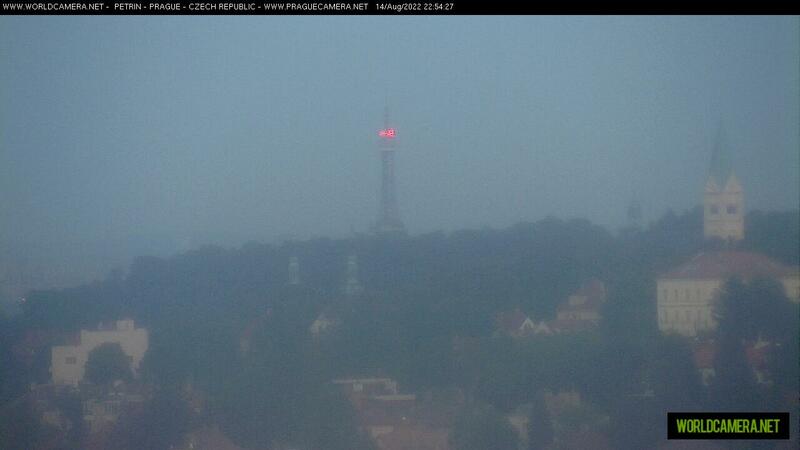 The construction was inspired by Eiffel tower in Paris and was designed by Frantisek Prasil. 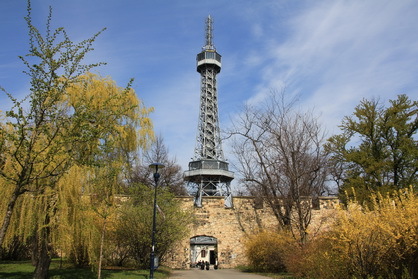 The tower is located on the top of the Petrin hill. The foot of the tower is in elevation of 324 m above sea level. The tower is 63,5 m tall, the observation platform is in elevation of 55m. The tower stairway has 299 steps. The tower as such is much shorter than the Eiffel tower but due to the hill where it stands the total elevation is higher. 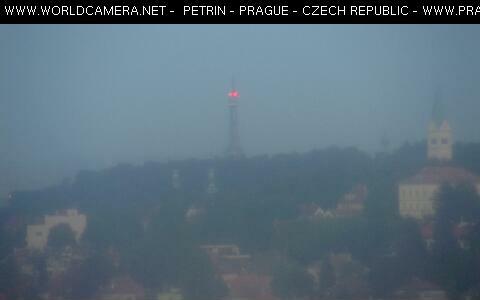 There is a great view of Prague skyline from the observation tower, which is accessible via stairs or lift. The tower served as TV transmitter in the past, currently most of the antennas were dismantled however. The tower was renovated in 2002 after the TV transmitting antennas had been removed. The lift was also reinstated in 1985 after renovation. A funicular from the city to the top of the hill was also build in 1891. Its operation was interrupted in 1965 and re-launched in 1985. Built in 1890 – 1891 in newromain style. Architect Frantisek Rozanek. The church is located in Sibeliova street in Praha 6 – Stresovice quarter. Renovated in 1948 and 2002. 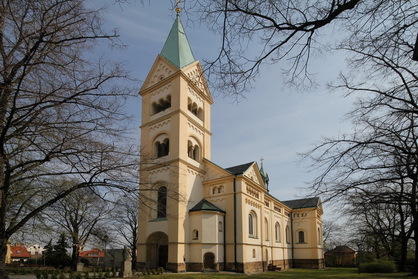 Belongs to Roman Catholic Church, Premonstratensian Order, Stresovice parish. 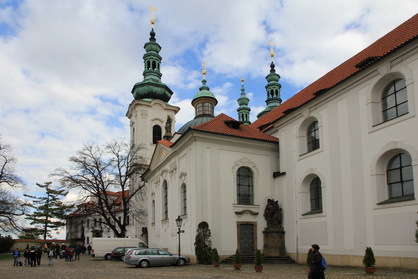 The Strahov Premonstratensian Monastery was founded in 1140 by Duke Vladislav II, Bishop Jan and Bishop Jindrich Zdik. The Monastery continues till the present time. 1250 the Monastery was damaged by fire, in 1420 plundered by Hussite movement and finally in 1648 during the Thirty Years’War the Monastery was plundered again by the Swedish army. In 1950 the Monastery was partially transformed into Museum of National Literature, in 1989 it returned back to the Premonstratesian order. 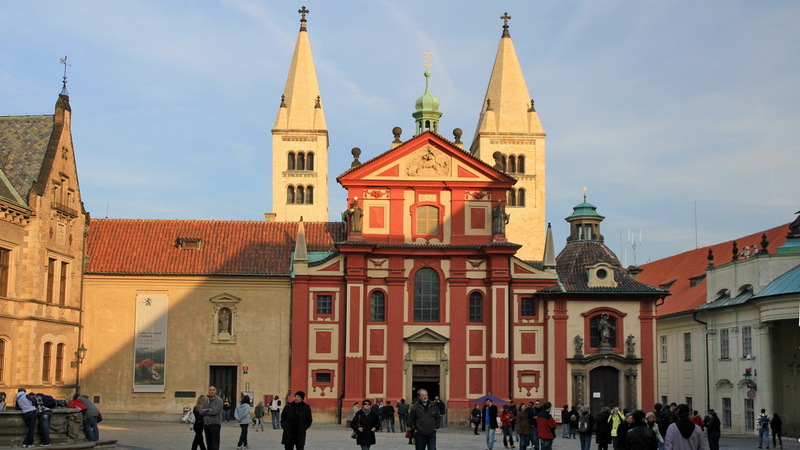 There is a famous Strahov Library, the Theological Hall and a picture gallery in the Monastery. 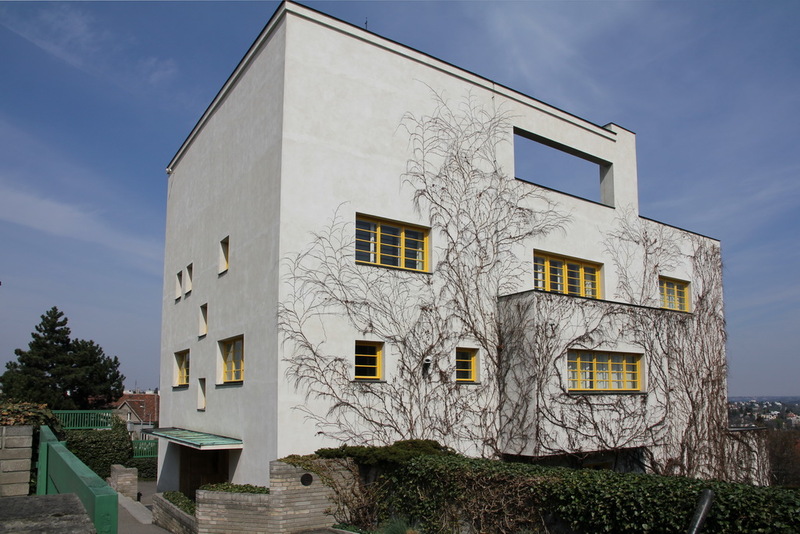 Luxury villa built in 1930 by known architect Adolf Loos for an entrepreneur Frantisek Müller. Villa is located in Praha 6 – Stresovice quarter, in the Nad hradnim vodojemem street. 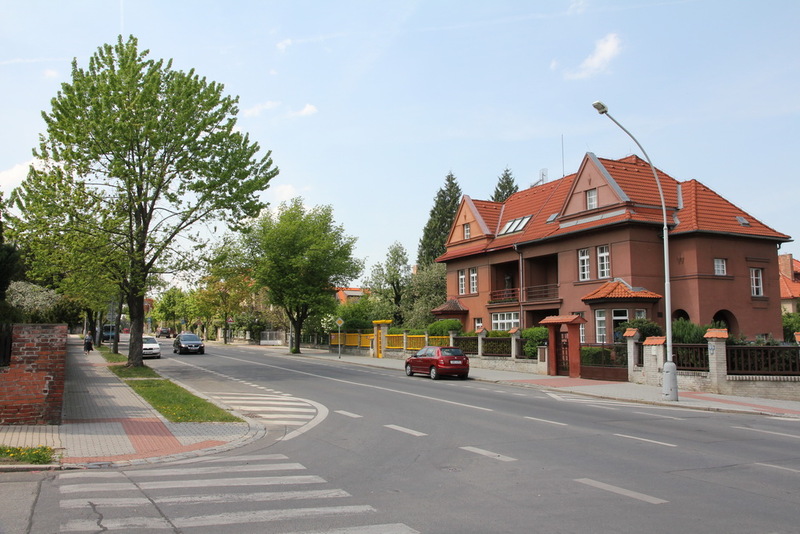 Designed in the style of functionalism and complies with Raumplan theory, where the rooms are created by cubes with different height and on different elevation. In 1997-2000 refurbished and declared for a National cultural monument. Interiors restored in the original design as to 1930 including the original furniture designed by Adolf Loos as well. This Prague quarter was built in 1920-1930 decade in the style of a garden city.